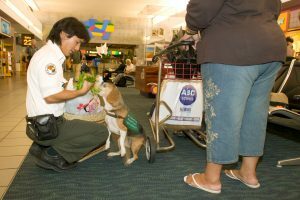 All baggage bound from Hawaii to the U. S. Mainland is subject to pre-flight inspection by the U. S. Department of Agriculture. Restrictions on the movement of fruits, plants, live snails, and other items from Hawaii to the Mainland are enforced to prevent the spread of fruit flies and other hazardous plant insects and diseases. Please report all agricultural items in your possession to the agricultural inspectors. Inspection stations for check-in baggage are located in front of the airline check-in counters while hand carried articles will be inspected at the entrance to the gate area. Be prepared to open and close your baggage and parcels for x-ray machine inspection. For further information call the U. S. Department of Agriculture at (808) 877-8757. Additional information is available at https://www.aphis.usda.gov/aphis/ourfocus/importexport.